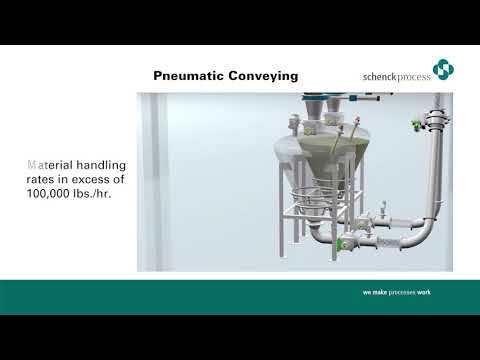 Schenck Process is your complete global source of pneumatic conveying, filtration, weighing, and feeding equipment. Schenck Process LLC is the result of integrating the technologies of Mac Process and Schenck AccuRate to provide customers world class service and complete system solutions engineered to work together. From raw materials to the packaging line, our experts will work with you to select the most appropriate cost-effective and energy efficient technology for your product. We deliver all types of pneumatic convey technologies and have a complete array of air filtration, weighing and feeding solutions to solve your toughest bulk material handling challenges—from sanitary markets all the way through heavy industry applications. Integrating two industry leaders: Mac Process and Schenck AccuRate brings you tremendous advantages. Building on long-term relationships with shared customers; a seamless integration of sales, aftermarket and Test-center resources ensures the best possible customer service. Combined business processes enable us to be more responsive. Most importantly, we can now deliver a unified system solution that is 100% engineered to work together. As one of the largest providers of pneumatic conveying, weighing, feeding and air filtration systems; we’ve moved, metered, controlled and captured thousands of products for multiple industries.